This post is brought to you by Core’dinations and Blueprint Social. As always, all opinions are my own. Have you noticed my love for ornaments by now? In addition to making them for myself, I also enjoy making them to give to grandparents as gifts. Let’s be realistic- grandparents can only receive so many pictures and photo gifts of the grandkids before their house starts to look like a strange shrine. Gifting photo ornaments is a good way to remedy this. It’s a photo that they can keep, but it’s still something that can be stored in the ornament box each year. I’m using several fun Core’dinations papers today, including the new Core’dinations Inkjet Printable Glitter Paper! 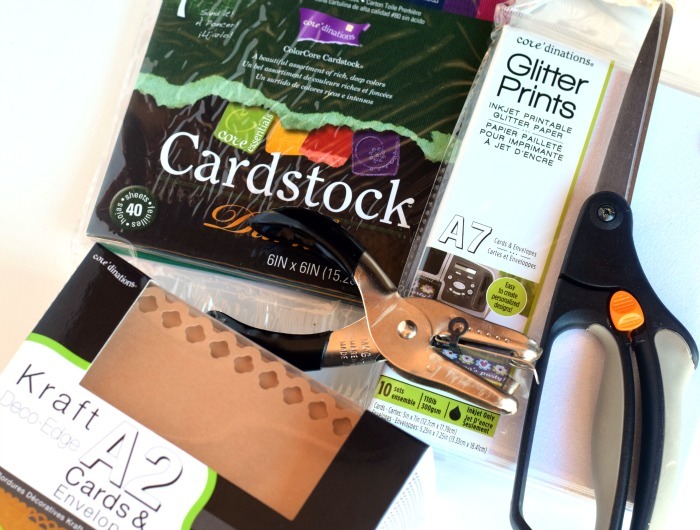 Begin with the Core’dinations Kraft Deco-Edge Cards. 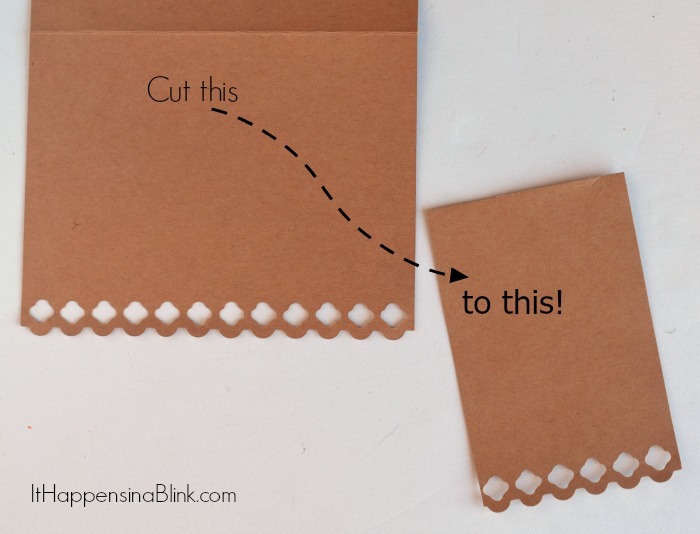 Grab one out of the box and cut the decorative portion in half to form a rectangle with the decorative portion at the bottom. 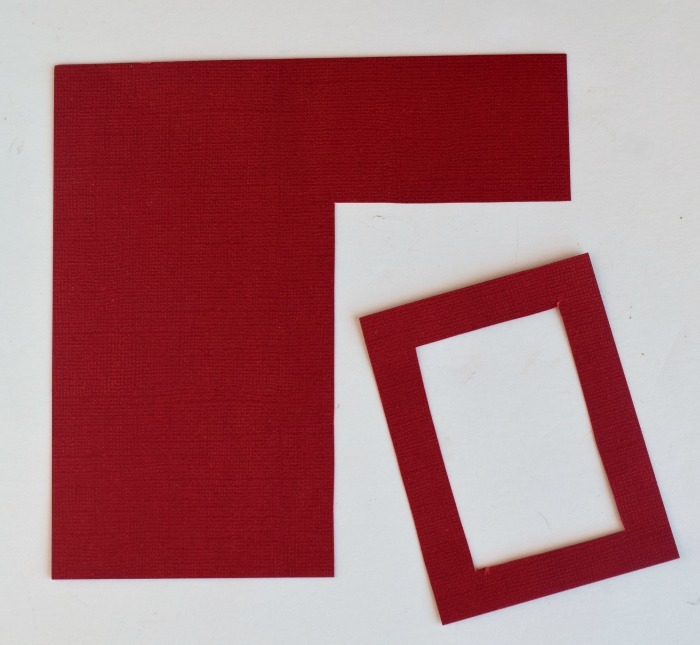 Grab a piece of red Core’dinations CardStock. Size a piece to fit as a frame over the brown kraft piece. Layer the two cut pieces with the photo. First, glue the photo to the brown kraft Deco-Edge piece. Secondly, glue the red frame over the photo. Now, it’s time to embellish the ornament! The Core’dinations Inkjet Printable Glitter Paper is a great way to personalize your ornament look festive for the season! 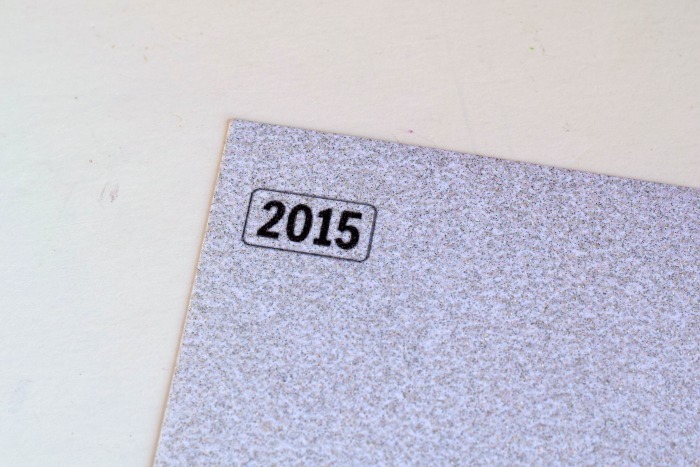 You read that correctly- you can now print on glitter! This glitter does not flake, and it works with any inkjet printer. It is a unique, smooth glitter paper designed for printing with optimal color vibrancy. Use your word processing software program or PicMonkey to create a small year cut out to adhere to the ornament. 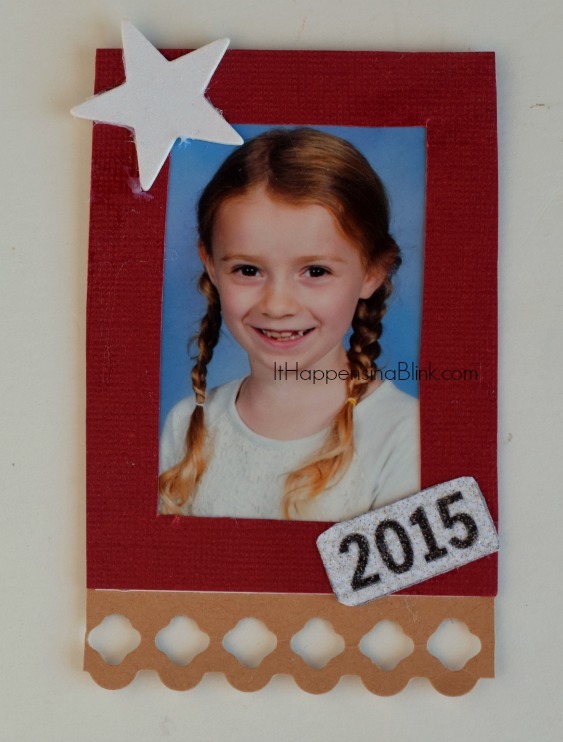 The Core’dinations Inkjet Printable Glitter Paper is perfect for this! I had a chipboard star that I glued to the top, but the Core’dinations Inkjet Printable Glitter Paper would also be great to layer as a star embellishment for the top! Lastly, use the hole punch to create a hole in the top of the ornament and thread ribbon or string through the top as a hanger. Easy, right? 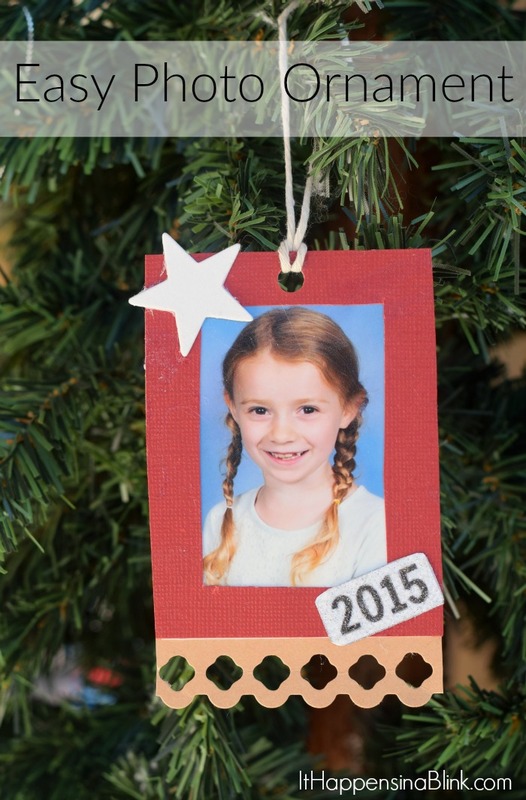 Use those school photos that you order earlier this year to make these simple ornaments as gifts for your family. If you have a die cutting machine, such as a Cricut or Silhouette, feel free to use it to make the cuts more concise and to make more ornaments in less time, but this project can definitely be made completely with no machine required! Core’dinations Glitter Prints are now available at Hobby Lobby and Michaels (under Michaels private label) and coming to Jo-Ann Fabric and Crafts Stores and A.C. Moore in early 2016! See more craft ideas on Facebook, Twitter, and Pinterest. I definitely have plenty of supplies! Haha! Oh my kids would love to see their pictures hanging like that. So creative. How pretty!! I would love to try this. This looks like a fun way to make an gift for a friend. 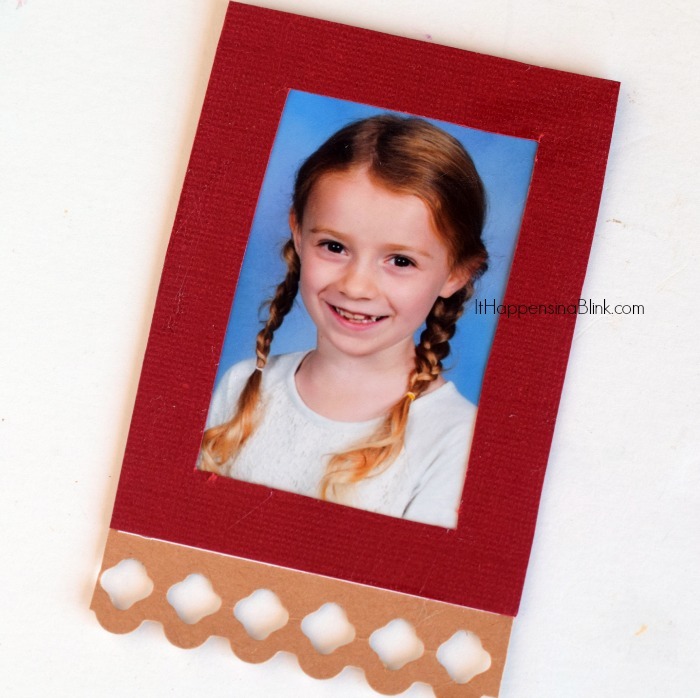 This is a very easy way to make a photo ornament. what a fun idea! would be a great gift for grandparents too! This is darling! I have one of those new instant cameras on my list, this might be the first thing we do with it! 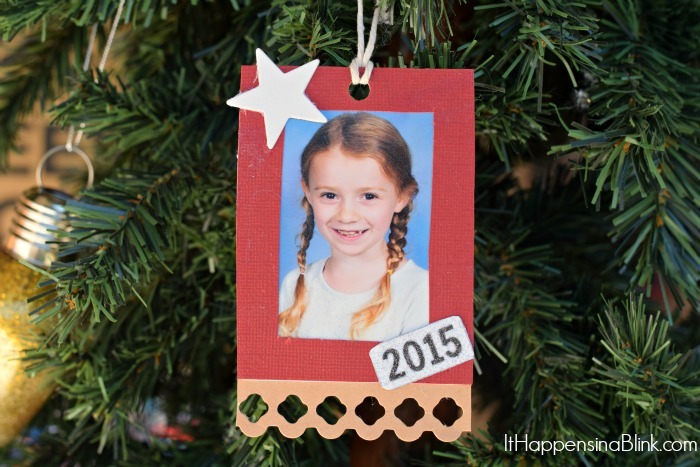 I love these ornaments that provide great memories in the years to come!